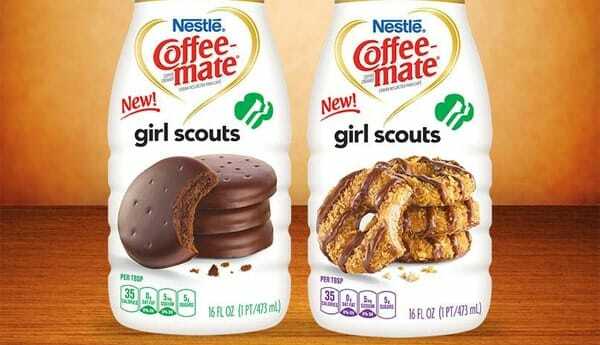 You guys…Girl Scout Cookies…in a coffee creamer. Can you really go wrong with that!?? I don’t always use flavored creamers in my coffee, though there are a few that I enjoy on occasion. However, I am OBSESSED with Girl Scout Cookies…Thin Mint and Caramel and Coconut in particular, so when I saw these Coffee-mate Girl Scouts Cookie Liquid Creamers hit store shelves, I practically flew home to brew a cup of coffee and give these a try. And while it’s no perfect substitute for actual Girl Scout cookies, these tasty little liquid creamers were certainly delicious and definitely offered a low calorie way to help satisfy my sweet tooth. They come in two flavors -Thin Mint and Caramel & Coconut, and both are equally delicious. These would be perfect for an after dinner cup of coffee instead of a high calorie dessert, as they are each just 1 Point per serving. Inspired by the BEST Girl Scout Cookies on the planet, Coffee-Mate created these two fantastic flavored liquid creamers that are a perfect way to make your coffee taste like a gourmet treat. And they clock in at just 1 Weight Watchers Point per tablespoon. Now, I need to start thinking of ideas of what kind of tasty dessert recipes I can utilize these in! I love the Caramel Delights one. However, it’s so hard to just stop at 1 TBSP. Currently drinking the thin mint one! LOVE IT!